Tulips produce bright and colorful cup-shaped flowers. Tulip bulbs are planted in gardens to add color to the landscape or grown in fields where the flowers are harvested and sold to florists. Or, you may see a group of tulip bulbs in a container as a planted display. Tulip flowers, whether in pots or flower arrangements, are a popular floral gift in the spring, especially for Mother's Day. If given the right conditions, tulip bulbs can be forced to grow and bloom within a specific time frame. You can do this in a greenhouse, under controlled conditions. Give the tulip bulbs the correct amount of chilling by either allowing them to sit in an unheated greenhouse, or by placing them in a cooler. They must not be exposed to light during the chilling time, or they may sprout. The length of chilling required for most tulip varieties is 14 to 16 weeks, depending on the variety. The temperature must stay between 35 and 45 degrees F during this time. Occasionally, you can purchase tulip bulbs that are pre-chilled by the grower. Do not allow tulip bulbs to freeze during the chilling period. If chilling in a cooler, check the tulip bulbs every few days and move them around. This prevents mold and mildew from becoming established between the bulbs. Ensure there are no fruits and vegetables in the cooler with the tulip bulbs. Fruits and vegetables give off ethelyne gas as they ripen that kills tulip bulbs. The amount of time from chilling to bloom time will take about 21 weeks, depending on the tulip variety. Plant the bulbs in the ground inside the greenhouse, or planting trays filled with potting soil inside the greenhouse, after the chilling period is finished. It takes four to six weeks for the tulips to bloom after planting in the ground or trays inside the greenhouse once they are exposed to the correct temperatures and light levels. When planting the bulbs directly in the ground or in planting trays, plant as close as 2 inches apart and 1 inch below the surface of the soil. This will give you longer and cleaner stems than if you are planting in the field where the bulbs are planted deeper for stability. Expose the planting area you have chosen for growing your tulips to a steady temperature of 65 to 70 degrees F. You many need to use a greenhouse heater to accomplish this if you're growing in the early spring when outdoor temperatures are still cool. If the temperatures are too warm, provide ventilation. If you're attempting to grow tulips in the heat of the summer, you will need to provide air conditioning, exhaust fans or other cooling device to keep the temperatures down to the desired level. 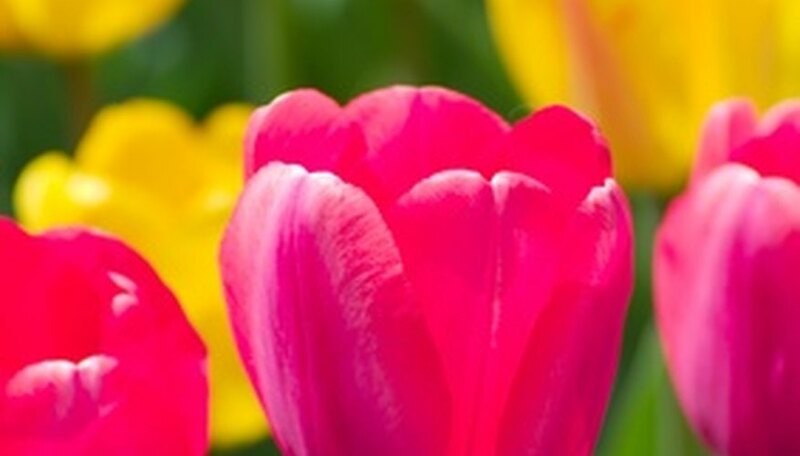 Temperatures that are below the required level will slow down tulip growth and cause the stems to be short. Temperatures that are too warm will cause the bulbs to bloom quickly on long, rangy stems, so keep the temperature at the required level of 65 to 70 degrees F for optimal flower production. Allow unobstructed sunlight levels through the top and sides of the greenhouse to reach the area the tulip bulbs are planted. No artificial light is necessary once the chilled bulbs are planted and exposed to the right temperatures and normal greenhouse light levels. When to Plant Tulips in the Middle Southern States?